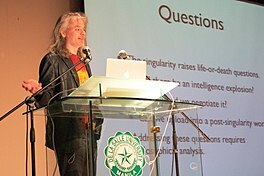 For other people with the same name, see David Chalmers (disambiguation). Chalmers was born in Sydney, New South Wales in 1966 and then grew up in Adelaide, South Australia. As a child, he experienced synesthesia. He also performed exceptionally in maths and secured a bronze medal in the International Mathematical Olympiad. ^ "The Thinking Ape: The Enigma of Human Consciousness"
^ "People – NYU Center for Mind, Brain and Consciousness". wp.nyu.edu. Retrieved 2016-12-11. ^ a b "David Chalmers receives top Chancellor's Award". Australian National University. 17 January 2014. Retrieved 2 October 2018. ^ a b c Keane, Daniel (6 July 2017). "Philosopher David Chalmers on consciousness, the hard problem and the nature of reality". ABC News (Australia). Retrieved 28 September 2018. ^ a b Lovett, Christopher (2003). "Column: Interview with David Chalmers" (PDF). Cognitive Science Online. 1 (1). Retrieved 9 October 2018. ^ a b "David Chalmers". National Portrait Gallery. Retrieved 9 October 2018. ^ a b c d Bartlett, Tom (6 June 2018). "Is This the World's Most Bizarre Scholarly Meeting?". The Chronicle of Higher Education. Retrieved 19 June 2018. ^ "David Chalmers". Edge.org. Retrieved 30 September 2018. ^ Jackson, Sarah (27 March 2017). "Are We Living in the Matrix?". Washington Square News. Retrieved 9 October 2018. ^ "Editorial Board (Stanford Encyclopedia of Philosophy)". plato.stanford.edu. Retrieved 10 December 2016. ^ "The Berggruen Prize | Philosophy & Culture | Berggruen". philosophyandculture.berggruen.org. Retrieved 2018-06-01. ^ Burkeman, Oliver (21 January 2015). "Why can't the world's greatest minds solve the mystery of consciousness?". The Guardian. Retrieved 7 January 2017. ^ Chalmers, D. J. (1995-03-01). "Facing up to the problem of consciousness". Retrieved 2018-10-10. In physics, it occasionally happens that an entity has to be taken as fundamental. Fundamental entities are not explained in terms of anything simpler. Instead, one takes them as basic, and gives a theory of how they relate to everything else in the world. ^ David Chalmers. "Zombies on the web". consc.net. Retrieved 7 January 2017. As far as I know, the first paper in the philosophical literature to talk at length about zombies under that name was Robert Kirk's "Zombies vs. Materialists" in Mind in 1974, although Keith Campbell's 1970 book Body and Mind talks about an "imitation-man" which is much the same thing, and the idea arguably goes back to Leibniz's "mill" argument. ^ consc.net Analysis 58:10-23, 1998. Reprinted in The Philosopher's Annual, 1998. ^ for a fuller explanation see Chalmers, David. The Conscious Mind. Oxford UP: 1996. Chapter 2, section 4. ^ consc.net Philosophical Review, 120:4, 2011. ^ Kaminer, Ariel (9 December 2012). "Where Theory and Research Meet to Jam About the Mind". New York Times. Retrieved 2 October 2018.